Since 2014, one in three startups created in France is a Marketplace platform. If you are an entrepreneur looking to launch or develop a Marketplace, listen to Olivier Godement from Stripe, the leading software platform for running an internet business. 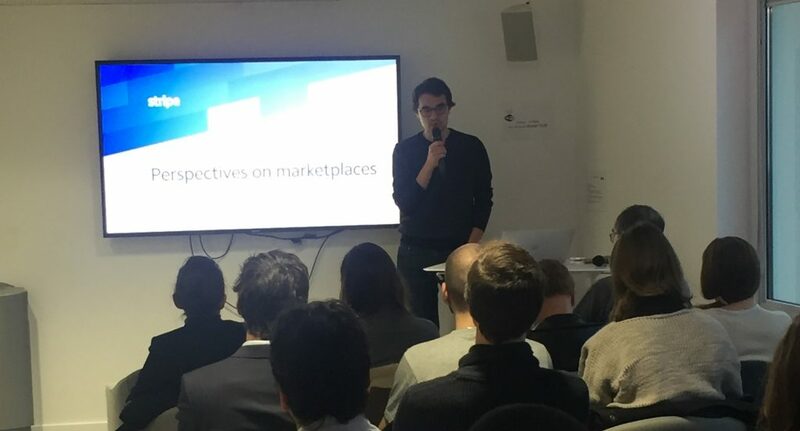 Hosted by the Partech Shaker, Olivier gave us some tips and concrete examples on how to improve the user experience on a platform designed for both consumers and merchants. 10 years ago, most Marketplaces focused only on connecting buyers and sellers and didn’t deal with product delivery or returns (the eBay model). Today, new trends are emerging, and we are seeing different types of online platforms: Mobile-on-demand; Peer-to-peer (renting of under-used assets such as Glovo or Airbnb); Crowdfunding and Software platforms (Shopify). The Marketplace era is just beginning. Stripe estimates that by 2020, 40% of global e-commerce will be intermediated via a Marketplace. Today in China, 90% of e-commerce purchases are already made via a Marketplace! Why are Marketplaces growing so fast? While many people believe that it is easy to launch a platform, the reality is in fact very different. Reaching critical mass is a difficult task. Generating liquidity and building an initial user base takes time. This is due to the chicken and egg issue: high-quality providers attract more customers and the growing customer base in turn attracts more providers… Marketplaces are also complicated to operate and scale technically: with users and providers coming from different markets and countries, you need to adapt to their specific needs and consumer behavior. Crack the chicken and egg dilemma by focusing on supply, to solve the liquidity issue and reach critical size. - Subsidize your offer. For example, when Uber targets a new city, they hire 100 drivers and pay them to drive empty so that potential clients can see that there are already plenty of drivers around. - Supply some tools. “Come for the tools, stay for the network” stated Fred Wilson. You can attract the offer by providing value-added tools: for example, you can attract restaurants to your restaurant platform by supplying them with invoicing tools. Hence, when clients actually go to the marketplace for the first time, they can already see a wide choice of restaurants. - Focus on small-sized and local markets before going for a global market. Yelp and Uber adopted this strategy and it works. Take your time and make sure you reach critical size on one market before expanding further. - Seduce users with a good App. Competition between marketplaces to attract the best sellers is fierce. - Automate payouts to avoid tools and errors. Receiving funds via a marketplace can stress a seller as they are not used to it. Avoid manual transfers and opt for API-based payouts. - Empower your power sellers with easy reporting. Your platform will attract sellers with different levels of commitment: some are occasional sellers and for others, it is a full-time occupation. Take care of these active sellers and try to offer them valuable insights such as statistics. - Leverage pre-built Apps for VAT and Invoicing. VAT can be a very complicated issue. To avoid any mistakes, Olivier recommends using Apps such as Avalara or Octobat. The number of internet mobile users is growing fast: from 4.2 bn in 2018, they are expected to reach 5 bn by 2020. Although consumers now spend more and more time on their mobile device (84% on mobiles against 40 % on desktop), they make more purchases through their desktop (60 % of spending through desktop versus 16% via mobile). - Adopt one-click and native experiences to enable repeat customer purchases. With Apple Pay, you can now pay on your mobile device via facial recognition and finger prints. - Deliver a local experience to your customers. If you are planning to launch a marketplace outside of your home country, do it well with a localized site adapted to local habits. Players such as Uber have managed to do this successfully. - Not all customers pay with a credit card. In France, 90 % of payments are made via a credit card, but this is not the case in every country. In Germany for example, credit cards only represent 22 % of online payments, SEPA 23 % and PayPal 15 %. To build trust with your users abroad, make sure that your marketplace offers their preferred payment system. Building user confidence is key for a marketplace as its offer is fragmented. Remember that if your users lose confidence in your marketplace, they won’t come back. - Keep away from the funds flow. According to the Payment Services Directive (PSD 2), marketplaces cannot cash funds on behalf of a third party. For example, if a buyer pays 100 euros, the marketplace cannot cash 100 euros but only its commission (10) and must directly transfer 90 euros to the seller. - Set clear rules to reassure your customers. Who addresses charge back? Who manages refunds and customers complaints? Does your policy guarantee that sellers will receive the amount promised? All these rules should be clearly stated on your site. - Comply with local requirements: “Know your customers, know your business”. You should check your users’ identity before sending money online, to ensure that you are not inadvertently involved with terrorists or money laundering operations. The Stripe platform enables startups and technology companies to monetize their business and develop their business online. Stripe has over 100,000 customers, including some of the most innovative companies to emerge in recent years (Deliveroo, Drivy, Kickstarter, ...). Olivier Godement is in charge of operations and development of Stripe with startups in France and Southern Europe. Before joining Stripe in 2014, he created SparkUp, one of the first French business crowdfunding platforms.